Veneers are thin restorations that are used to improve color, close spaces, and correct the shape of teeth. Veneers require less tooth preparation than conventional crowns and are made of porcelain or resin. A bonding process is used to attach veneers to teeth. Porcelain veneers are the “Gold Standard” in esthetic dentistry. Historically, these restorations required laboratory fabrication and temporary acrylic veneers were utilized during the time frame the veneers were being made. 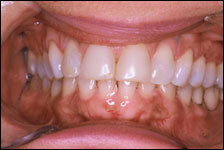 In many cases, the temporary veneers would fracture or be displaced because of their fragility. Now, with Cerec technology, Dr. Roska is able to prepare, design, mill and bond porcelain veneers in One Appointment. This is a significant advancement in dental technology and provides an incredible service that few dental practices have the ability to offer. 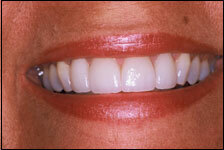 Dr. Roska can also fabricate and place resin veneers in One Appointment. Resin veneers are usually placed in a situation that is temporary or transitional. They look very esthetic, however, do not have the long term predictability of porcelain veneers.